EOS Flower Series. The design on these lenses made to look like flower petals. A bit translucent in towards the middle but shows some brightness closer ot the edge. + Shipping $7 USD for USA/Canada, and $10USD for International. I believe it used to be $5 but once again, this probably changed because last time I checked was in June 2010. 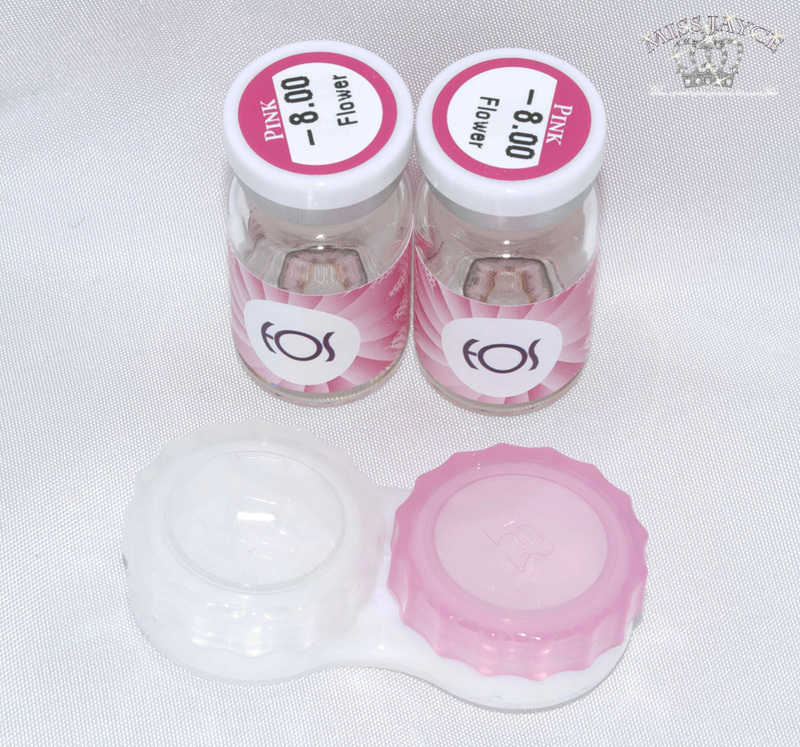 The Flower Pink are my second pair of pink lenses from EOS. 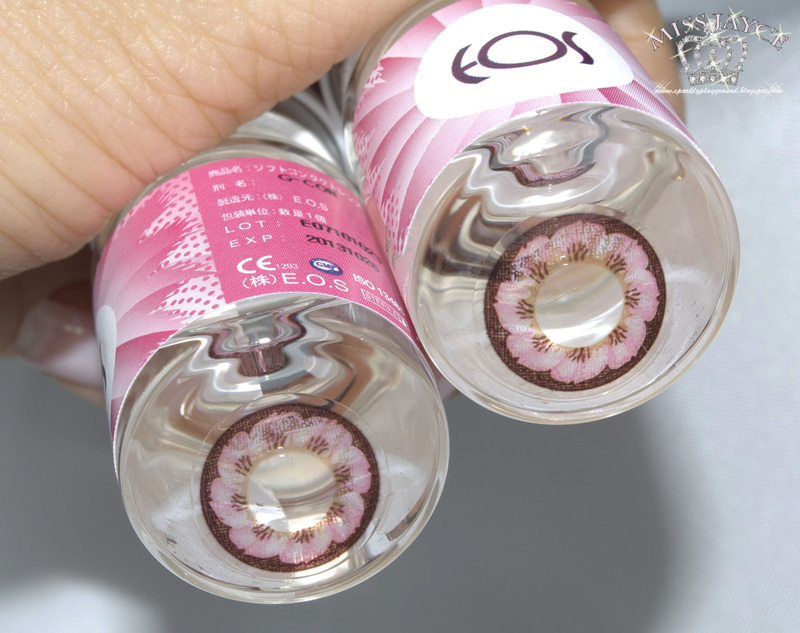 I love the design of these lenses, they are like pink sakura flowers. They are so beautiful!!! I noticed that these lenses help my eyes appear brighter and have a crystalline effect! The pink flower design is not very opaque on dark brown eyes in indoor lights. I like my lenses very opaque and obvious especially when it comes to pretty designs as such, but these lenses only gives me such effect when I have super flash photography. The enlargement factor is not significant at 14mm diameter. 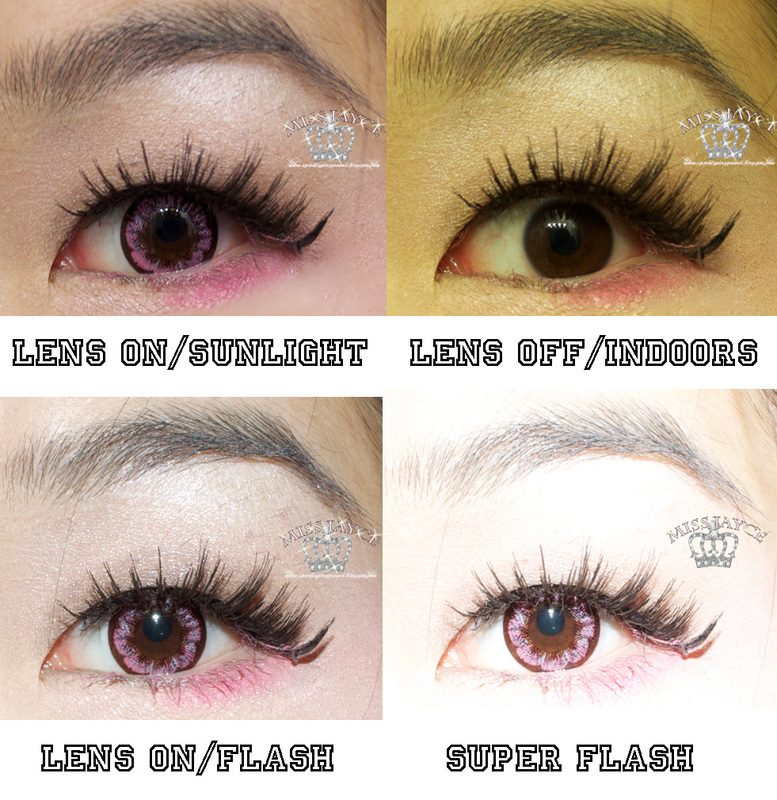 The lenses also have a brown ring which gives off a nice enlargement effect yet not too harsh compared to a black ring. These lenses provides natural enlargement without being overly dramatic. On comfort level, I find that it blurs my vision every now and then. I always soak my lenses in clean solution and yet the blurring still occurs. I have to blink a few times to get the blurring to go away. Also, it tends to slide a little bit. I noticed this as I saw that the pink was very evident on my whites. On durability, I can wear these lenses for 5-6 hours without feeling dry but I try not to wear these for any longer than that. 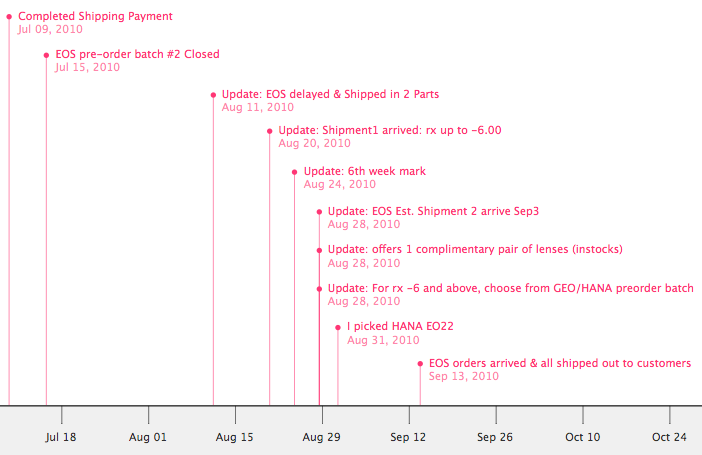 I don't usually do timelines for my reviews on contact lenses but because this was a very different case. This is a Semi-Sponsored Post , where I was provided the lenses for free and I paid for the shipping fee. I initially wanted these lenses for my birthday (October) and knowing the disadvantages of having a high rx, I usually plan early like in June (this is when Kiwiberry1 and I were in contact). 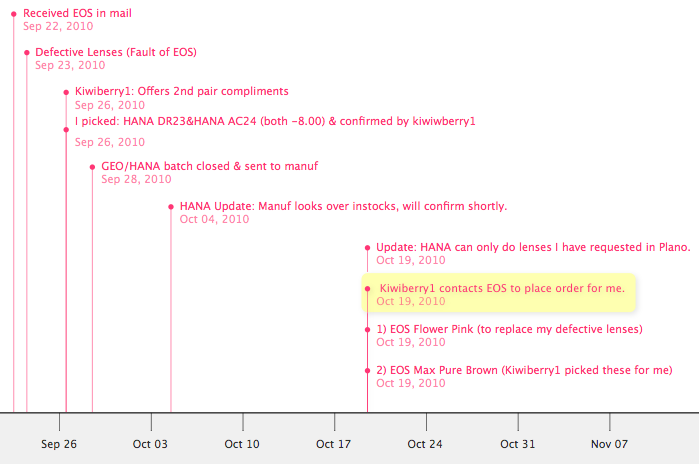 The timeline shows all the details that has happened during this transaction; I went back to all the emails to summarize what has happened and get the dates right. I love the constant updates, as a customer, we all want to know what's going on. I liked how the company takes the responsibility when problem arises, and they offered a pair free complimentary lenses for all customer who were in that same batch. The communication has always been timely and respectful. 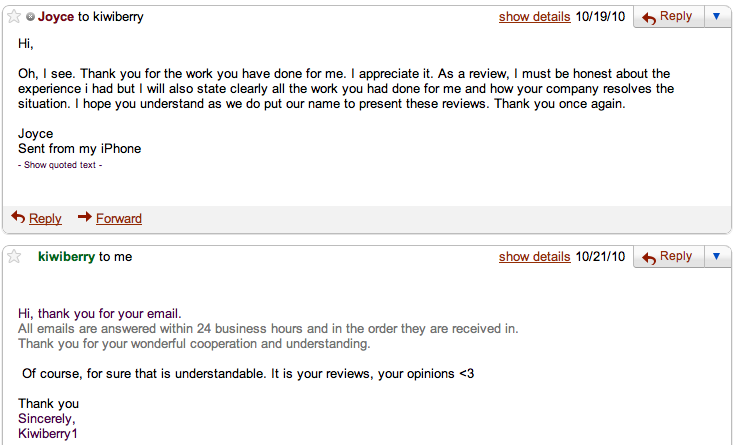 Even when my tone in emails became serious and stated my review will be honest and will state every detail (meaning all the problems/cons that occured) The staff was still very genuine. Please see excepts from emails below. I am a little skeptical about the part when the Manufacturers said they dont make particular Hana lenses at rx because I felt that Kiwiberry1 should present accurate info when customers chooses their lenses instead of finding out afterwards (another 2 weeks wait). Do Manufactures actually provide inaccurate info to their retailers (Kiwiberry1)? I'm not sure. I was very upset with the entire transaction at this point. Packaging: 5/5 ♥ Nothing was broken when received. It was packed with bubble wrapped packaging. You can see noticeable shifting of my lenses in the right eye. What do you guys think of the Flower Pink lenses? What about the Black hair?